The Covington Police Department’s Fuzz Run was created as fundraiser for the Police Who Care Fund. The Police Who Care Fund (PWC) was started in 1974 by Officer Frank Hilton. In 1983, the first annual Fuzz Run was established by Captain Willie Davis at the direction of Chief Bobby Moody. The Fuzz Run consisted of a one mile fun run and a 5k race and has remained in that format to the present day. The Fuzz Run began as a way to raise money to aid officers who were injured or families of officers killed in the line of duty. The first couple of years, the Fuzz Run did not make any money. Around the third or fourth year, all the proceeds were donated to the construction of the Public Safety Memorial at GPSTC. The Fuzz Run was almost discontinued in the mid 1990s due to lack of participation. The number of participants had dropped to less than 50, but Chief Moody decided to give it one more year. The Department’s Community Outreach Division was started, and they took over the planning of the event and it began to grow to what it is today. The race quadrupled in size the following year and continued to double each year for several years. The popularity and quality of the event earned the Fuzz Run the distinction of being voted “Best Race in Georgia” by Run and See Georgia Magazine. The 25th Anniversary Fuzz Run reached an all time participation record of 2,641 runners and walkers. 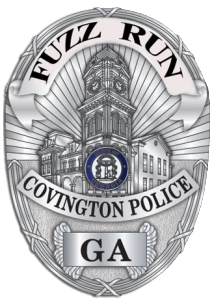 The Covington Fuzz Run is always held the second Saturday in September, and is the primary source of income for the PWC fund. Over 2,000 runners participate in either the 5K road race or the one mile fun run. Racers get to enjoy a Peachtree Qualified race course that takes them through the beautiful, historic City of Covington. Annually, the fund contributes to the American Cancer Society’s Relay for Life, Special Olympics, YMCA, Project Renewal, Miracle League, and Shop with a Cop, just to name a few. In addition, the fund makes a $1000 contribution to the beneficiaries of every Georgia law enforcement officer who dies in the line of duty. The PWC also helps City of Covington employees when disaster strikes them. 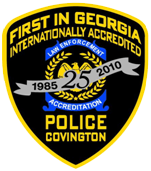 The fund is overseen by an eight member Board of Directors; which includes one civilian member of the police department, two supervisors, two sworn members, two civilians, and the Chief of Police or his designee. The Board’s officers include: a Chair, Vice-Chair, Secretary, and Treasurer. Fuzz Run sponsorship has grown over the years, and as of 2014, we were fortunate to host over 40 sponsors. This race would not be possible without our community involvement, donations, and sponsors. We are excited to join the ranks of other cutting edge races, and announced that 2015 is our first year using a Bib Tag Timing System. Runners can now view their results with their smart phone and snap the QR code from their bib to get live race results, in addition to online and via email.